"Prevention is the best method to reduce tick encounters"
Video demonstration of juices transmitting Lyme Disease from tick to pet. Advanced Care Pet Hospital treated 58 dogs in 2016, 60 dogs in 2015 with Lyme Disease, 65 in 2014, 39 in 2013. Lyme disease cases are growing. There is an upward trend in Lyme Disease transmission in Minnesota. People are now learning their yards are not immune to ticks. Before Advanced Care opened in 2009, few dog owners in the St. Cloud area were advised to treat their dog's Lyme disease. Many did not know a vaccine was available before coming to Advanced Care. 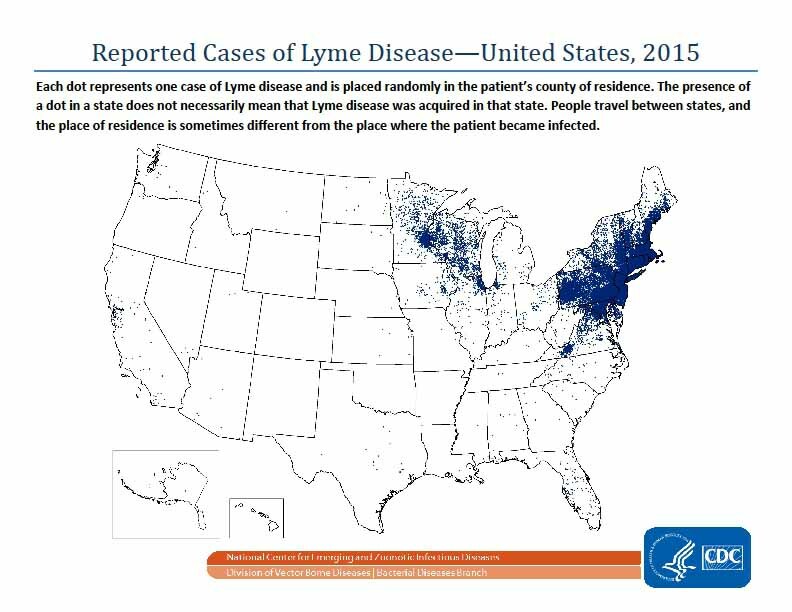 This map from the CDCindicates regions of the U.S. (2015) where humans have been diagnosed with Lyme disease. A clear risk is seen across most of Wisconsin and northern Minnesota. Lyme disease was recognized in Europe for nearly a century but not described in humans in the United States until 1975. According to Beth Berlin, Minnesota Extension, Minnesota is home to 13 known species of ticks, with the majority known as "hard ticks," which have fairly hard bodies with plate like shield behind the head. Many wildlife mammals and birds become infected, serving as reservoirs for tick populations. During the 1980s the incidence of the disease in both humans and dogs increased dramatically. Lyme disease is now the most common arthropod-borne disease of humans in the United States, and one of the most common in dogs. Lyme Disease risk for dogs is higher than for humans as they are running down low among the grasses and undercover wherethe ticks are, pets can't easily identify and pick off the ticks themselves and finally, ticks can be hard to spot under fur by pet owners. Lyme disease is caused by Borrelia Burgdorferi, a corkscrew-shaped bacterium of the spirochete group. Deer ticks, hard-shelled ticks of the genus lxodes, transmit B. burgdorferi by attaching to and feeding on various hosts. After the tickattaches and begins to feed, spirochetes residing in the mid gut of the tick to migrate to the salivary glands and from there move into the host. Infection danger goes up when ticks are allowed to feed for prolonged periods becoming engorged. Some research found infection danger is minimal during the first 12 hours of tick feeding. Beyond this, the risk of infection increases exponentially. In contrast to human cases of Lyme disease, where 3 stages are well known, pet owners tend to first notice arthritic symptoms in their dogs like sudden lameness, limping, pain indications. The first stage in humans, a skin rash called erythema chronica migrans, is rarely seen in dogs. Dogs simply do not get the round ring surrounding the bite, however there may be irritation at the bite site because it itches and dogs will scratch or bite to relieve the itch. Commonly noticed symptoms include a lethargic dog off their feeding. Some dogs appear depressed and are reluctant to move. Lameness occurs in 2 to 5 months after tick exposure on average. Lameness may recur after a period of recovery lasting several weeks. Consequences of untreated disease include kidney failure, neurological issues like seizures, aggression and behavior changes. How Likely is My Dog to Get Lyme Disease? In Minnesota, an endemic area, tick infestation “hot spots” have greater probability of exposing your dog to Lyme disease. Grassy areas are a favorite environment for certain species of ticks. Back yards and lawns which receive bird and outdoor mammal traffic are not immune to hosting ticks. How is Lyme Disease in Dogs be Diagnosed? There are several ways to examine the immune response to B. burgdorferi infection in dogs. At Advanced Care, we use a "Snap" test which detects Lyme antibodies in dogs blood and results are available while you wait. We have results for you before you leave so we may treat your dog with antibiotics if needed. While there are additional antibody titer tests which measure the dog's specific antibody response to B. burgdorferi infection, the tests require samples to be sent into a lab. These are quite a bit more costly and time consuming. Numerous titers need to be performed to measure change in response. Snap tests detect the presence of the antibodies for Lyme disease and 2 other tick borne diseases as well as test for Heartworm disease. It is part of our annual examination/screening program for all dogs here. Can My Infected Dog Be Treated? Antibiotics are the treatment of choice for Lyme disease in dogs. Because B. burgdorferi has the tendency to persist in dogs, antibiotics are administered for three or four weeks. Like human treatment, medication needs to be fully administered through the end of treatment despite seeing a relaxation of symptoms. Failure to administer all the medication may cause the disease to persist. What is the Prognosis for Lyme Positive Dogs? Dogs respond very well to antibiotic treatment. There may be recurrent disease, but dogs again respond well to treatment. Complete recovery can eventually be expected in a majority of cases. It can be stubborn to eliminate, we have seen sever patients requiring several repeats of the prescribed antibiotics. We have seen only a few cases where the disease progressed beyond the ability of the patient to be treated. There are several approaches to preventing infection in dogs. One is limiting tick engorgement on dogs by controlling tick populations, using tick repellents, and/or grooming daily. Another is vaccination. And finally there is limiting your dog to living indoors. Of course this last one sounds unreasonable, but it is no less unreasonable than the pet owners who say they dogs can't get ticks because they stay in the yard. CAPC continues to recommend year-round parasite control for both dogs and cats. Additionally, the organization recommends regular examinations at least annually by a veterinarian. “While virtually all infestations of parasites are preventable, estimates indicate that fewer than half the dogs in the country are protected,” says Chris Carpenter, DVM, MBA, executive director for CAPC. In Minnesota dog owners can expect drastically reduced tick populations during months with solid snow cover on the ground. However, any warm snaps which expose the underlying ground cover can arouse tick populations. Play video to learn why we recommend Vectra for our clients who care for their pets. Disease-carrying ticks pose health risks to dogs and people, no matter where you live. The Centers for Disease Control (CDC) reports that ticks in every U.S. state carry diseases, and the number of tick-borne diseases is increasing. But do you know the myths and facts about ticks? Here, DogsAndTicks.com debunks some of the most commonly believed myths about ticks so you can protect your pets. Fact: None of these methods cause the tick to “back out,” and all of them may actually result in the tick depositing more disease carrying saliva into the wound, increasing the risk of infection. The best way to remove a tick is to grasp it as close to the skin as possible with tweezers and pull the tick’s body out with a steady motion. Wear rubber gloves, and clean the skin with soap and water after removal. Dispose of the tick by placing it in alcohol or flushing it down the toilet. Fact: Lyme is the most widely known and common tick disease, but there are many others that ticks carry and can transmit to dogs and people. These include Rocky Mountain spotted fever, anaplasmosis (sometimes known as “dog fever”), ehrlichiosis, and some emerging diseases with potentially devastating effects. Fact: According to the CDC, laboratory results for tick-borne illness in people are often negative on the first sample and require a second testtwo to three weeks later to confirm infection. Children are more susceptible to infection due to their immature immune systems. Signs of Lyme are flu-like symptoms such as fever and malaise with or without a bull’s-eye rash, but many people (and dogs) with tick-borne illness don’t experience any symptoms, especially in the early stages of the disease. Myth #4: Ticks aren’t a problem in the winter when it’s too cold for them to live outside. Myth #5: Ticks live in trees, so as long as I don’t live near or visit a wooded area, I don’t have to worry about them. Fact: Ticks live on the ground no matter the locale, be it an urban park or a rural farm. They typically crawl up from grass blades onto a host and migrate upward, which is why they’re often found on the scalp. Since signs of tick-borne disease are difficult to recognize in pets and people, simple preventive measures and understanding as much as possible about these creepy crawlers is the simplest way to keep everyone safe. Here are answers to commonly asked questions about ticks and Lyme disease. For more information, follow up with your veterinarian. Lyme disease is a bacterial disease spread by ticks. It’s most prevalent in the North East, but it has been discovered in almost all parts of the United States. Lyme disease affects dogs and humans and is rare in other domestic animals. A bite from a tick, most commonly the blacklegged deer tick, transmits the bacteria to dogs. Wooded, dense areas are common locations for these ticks. When it’s attached to a host, ticks can spread Lyme disease through their saliva. It is not spread from one person to another or from a dog to a human. A rash may appear around the tick bite soon after infection; however, it may not be noticeable if your dog has a lot of fur. Other symptoms include fever, lethargy, swollen lymph nodes, loss of appetite, and limping. Some infected dogs don’t show any symptoms, making it difficult to diagnose. The disease can cause kidney inflammation, and it can damage the heart and nervous system in its later stages. Blood or joint fluid tests are often needed to diagnose the disease. Antibiotics like doxycycline can help treat dogs. Additional medications can help with pain and inflammation. Treatment can take months or longer, and it’s most successful when it’s started within a few weeks of infection. It’s possible for the bacteria to remain in the body long-term, leading to periodic flare-ups. It’s best to avoid areas infested with ticks. Tick repellents are beneficial for people and pets, but be sure to read all labels carefully and follow safety precautions. Your veterinarian can recommend effective tick control products that are safe for dogs. After leaving a tick-infested area, check your dog—and yourself—thoroughly. You can remove attached ticks with tweezers or inexpensive tick removal tools. Grasp the tick as close to the skin as possible and pull it straight out. Do not apply insecticide or a hot match—this may increase the amount of saliva released by the tick. After you remove the tick, clean the area with antiseptic soap and wash your hands. There are Lyme disease vaccinations recommended for dogs living in areas where the disease is prevalent. Check with your veterinarian to see if your dog should be vaccinated.